NFL Predictions NFC West: Can The Cardinal's Repeat? 2010 NFL Schedule: January 16th, 2010. The Arizona Cardinals were on top of the world winning several NFL predictions matchups. Coming of a thrilling overtime victory over the Green Bay Packers the week before. On their first play from scrimmage, Tim Hightower busted loose for a 70 yard touchdown run to take a 7-0 lead in the NFC Divisional Playoff NFL picks game against the New Orleans Saints. They were the previous years Super Bowl runners-up and had their sights set on a return trip. Then they collapsed. The Saints scored the next three touchdowns and the rest of that NFL picks matchup is history. The Cardinal's have been spiraling downwards since then. Future Hall of Fame Quarterback, Kurt Warner retired. Wide Receiver Anquan Boldin bolted to the Ravens and defensive stars Karlos Dansby and Antrel Rolle also signed with other NFL teams. 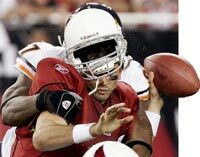 The Cardinals responded by signing veteran linebacker Joey Porter from the Pittsburg Steelers and drafted nose tackle Dan Williams with their first round pick.The biggest questions concerning this years team is 1).Can Matt Leinart play qarterback in the NFL? 2) Can the Cardinals improve their porous defense? 3) Can coach Ken Whisenhunt continue to motivate and teach young talent. The consensus is that the San Francisco 49'ers will win the NFC West this NFL predictions season. They are listed at 25-1 to win the 2011 Super Bowl. The Cardinals are 60-1, Seattle 60-1, and St. Louis is at 100-1. For my 2010 NFL predictions I still like the Cardinals to win their division. Larry Fitgerald, Steve Breaston and rising star Early Doucet will give Leinart plenty of targets to throw to, and count on improvement with their running game featuring Beanie Wells and Hightower. I think that a record of 9-7 will be enough. 10-6 will definitely get it done. But I can picture it going down to the final week of the NFL predictions season with the three teams not named the Rams, all having records of 7-8, or 8-7. And we still have to be concerned about Pete Carroll and the trend of the near retired quarterback (Matt Hasselbeck) in Seattle.There are opportunities for money making wagers here. Now get on board and bet on the Cardinals to make the 2011 Super Bowl picks matchup at Bodog.com and take advantage of their NEW BONUSES! The Vegas style online sportsbook is now taking NFL predictions on everything NFL, including your selection on who will win the 2011 Super Bowl. Whether you plan to Bet the Arizona Cardinals or anyone else Bodog.com has got your game.